A Quilting Sheep: Modern Building Blocks- top is done! It took some creative effort to get a picture of this one. A step ladder may have been involved. ;-) I would rather have taken an outside photo, but a step ladder in a foot of snow would have made me look sillier than I already am. My neighbors talk enough already. The letters are Just My Type by Quiet Play and can be found on Payhip. She has a lot of super cute paper pieced patterns. =) The hearts are by Cluck Cluck Sew. I want to make more of them because they are just so cute! In anticipation of Lori Holt's new book coming out, Farm Girl Vintage, and needing a backing for this quilt (which was made with all Lori Holt fabric) I made a trip to a local quilt shop that carries a lot of her fabric. 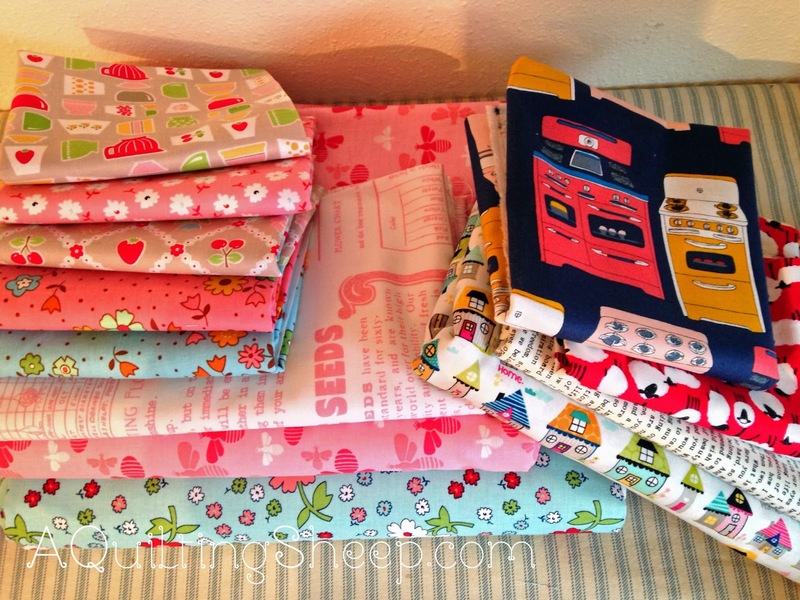 Sorry for the poor quality picture...All the fabric on the right are Lori Holt's fabrics. The bottom two are for the back of the Modern Building Block quilt. That's the plan, at least. While I am sharing the picture, the house fabric on the left is going to be used somehow in the Sew Sweet Bee house quilt my bee sisters are making for me. The stove fabric was a "just because it's cute" purchase, as was the sheep fabric. And I can never turn away from a great text fabric. Just like that, my paycheck was gone, but what a fun way to go! I am so in love with your quilt. Love how you placed your words. Sew sweeet. Your quilt is so beautiful! I think the colors are so happy and didn't realize that all of the fabric was from Lori's lines. I zoomed in and noticed all the familiar prints. The words that you substituted are so sweet and personalized. If there were a contest for this pattern, I'm sure you would take first prize!!! Oh Amy, what a BEAUTIFUL Quilt.Each block and each word and sayings are just so perfectly placed. Love the whole color combination. That is a real Treasure, especially as it was a combined effort with your hubby :)! Great job on your quilt! It went together so fast! I love the addition of the words. Yummy fabric pile. I cannot wait for her book. Probably one of my favorite quilts of all time. LOVE it!!! Wow ~ I love your quilt and the way you personalized it! Congrats on a beautiful finish. Awww that is just wonderful Amy. Maybe you can get it quilted by Valentine's Day. You did a great job I love this layout. Your quilt is beautiful! And how special to customize it. I love that Russ came up with most of the text. Just in case you don't already know it, he's a keeper! :) But somehow I don't think that's news to you. Your quilt is fabulous! Love your fabric acquisitions too. I love how you changed up the quilt. I can't tell you how much I love this quilt, it's amazing and so unique. Bravo you!!! 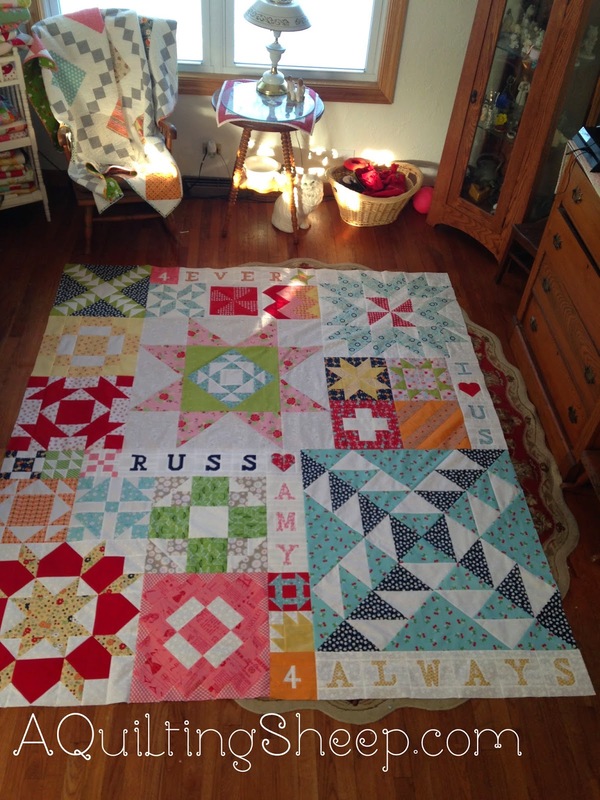 That quilt is gorgeous, and how lovely hubby came up with the words!!!! Your purchases are great - what else would you use a paycheck for, anyway??? LOL! Amy, it's gorgeous and I love that you and Russ collaborated on the design. Makes it even more special! I wish my quilt shop carried some of that cute fabric! The houses will be a perfect border! Great quilt that you both designed. Very very sweet!! I will never catch up with you this winter! !...well, I guess I have my excuse of moving and renovating!!...chee.....wink!! Love your work!! LOVE your idea of R%A cuteness!! Love the quilt pattern and colors. Beautiful!! We're in snow here, too. More than usual. One week of teaching has been great!